Mumbai, December 6, 2018: Deloitte India today released the India Corporate Fraud Perception Survey, edition III, 2018. Almost 58 percent of respondents polled in the survey believe that corporate fraud will increase in the future but, appeared optimistic about their organizations’ abilities to manage fraud. Interestingly, this is a sharp decline from the previous editions of the survey (conducted in 2014 and 2016) where around 70% of respondents felt corporate fraud was likely to prevail over the coming years. The top three reasons for fraud were identified as lack of an efficient internal control/compliance system, diminishing ethical values, and senior management override of controls. Among the respondents who indicated having experienced fraud previously, said that the most common fraud and misconduct schemes included vendor/customer/business partner favoritism, inventory pilferage and diversion/theft of funds. However, only 17% of respondents indicated that their organization had experienced bribery and corruption in the recent past. This may be a result of better internal controls instituted to prevent bribery, as well as measures taken by the government in recent times to limit avenues for bribery. About 49% of respondents indicated losing more than Rs 10 Lakh in fraud losses in the recent past. Surprisingly, junior and middle management employees were identified as being most likely to commit fraud. About 64% of respondents, however, believe that suspicious behaviors in employees could be identified early on and dealt with appropriately to prevent fraud. Technology is increasingly being employed as a fraud control tool in organizations. The survey identified. The most commonly used techniques and tools to prevent fraud were identified as reliance on control based reports generated by the ERP system (54%), a risk-based approach for analytics (44%), and traditional statistical analysis and data mining tools (41%). A fourth of the respondents also indicated that they had implemented or were implementing next-generation tools and techniques such as voice search and analysis, link analysis, social network analysis, sentiment analysis, data visualization, interactive dashboards, machine learning, robotic process automation, and artificial intelligence. “Undoubtedly technology is helping organizations better manage the risk of fraud. Bolstered by the successful outcomes seen over the last two years, organizations are now investing in the next level of anti-fraud technologies that rely on machine learning, artificial intelligence, and robotic process automation platforms,” added Mr. Bedi. The survey further revealed that fraud was detected primarily through whistleblower hotlines. About 59% of respondents indicated that fraud related observations were addressed immediately, by way of commencing investigations – internally or assisted by third parties. About 49% of respondents pointed out that once the fraud was ascertained, the fraudster was allowed to resign in lieu of filing a legal case in the majority of cases while a third of respondents indicated that they took legal action against the fraudster. This survey report was developed on the responses received to a Deloitte India questionnaire that was circulated to leading CXOs and working professionals across all major sectors and organizations working in the area of fraud risk management duringAugust- October 2018. The survey saw 439 responses, of which two–thirds of respondents identified themselves as decision-makers in the finance, operation, information technology, compliance, legal, internal audit, and fraud risk management areas. Close to 70% of survey respondents identified themselves as belonging to organizations with over Rs 250 crore turnover. 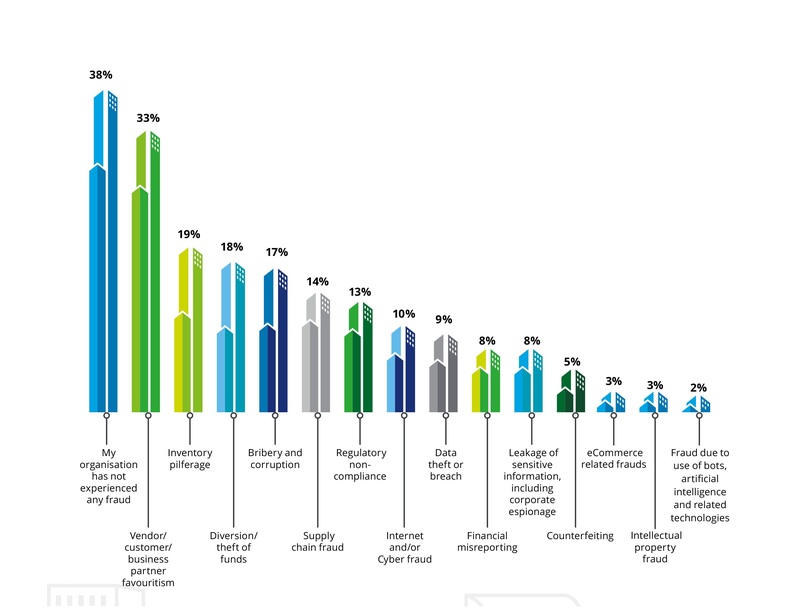 This edition of the survey also provides insights on the future of fraud, including who the future fraudster would be, what is new in cybercrime, the impact of IoT devices on fraud investigations, using bots to conduct due diligence, implications of regulatory action on fraud, and building an anti-fraud sentiment in entrepreneurship.